The Office of Alumni Affairs and Placement Services in partnership with the AUF Federation of Alumni Association gladly announces the issuance ofAngelenean Alumni card. The ID Card gives identity of the alumni and graduates of AUF, it would entitle the card holder to avail discounts and other privileges given by the different partner establishments. 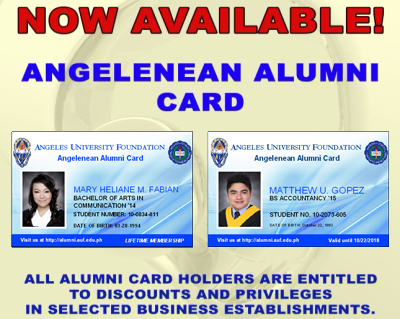 Thus, we are inviting all our dear alumni to secure your Angelenean Alumni Card.